Getting started with essential oils can feel overwhelming, purely because of the sheer number of brands and oils on the market. It doesn’t have to be that way! 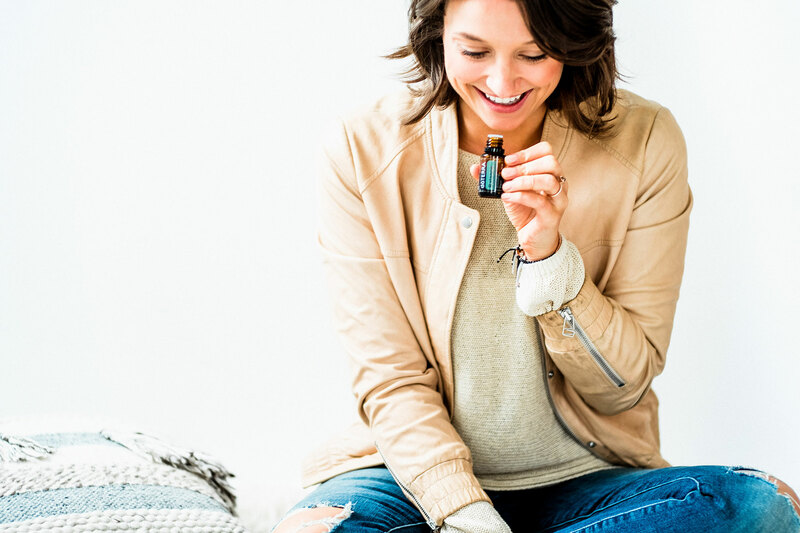 With DoTERRA CPTG® (Certified Pure Therapeutic Grade) essential oils, you can rest assured that you’re getting the most potent and pure essential oils on the market. You’ll also receive all of the education and support you need to get going on your all-natural and empowering journey. More than just a calming oil! When used on the skin, lavender is powerful against reducing skin imperfections of all kinds. I like to add it to my moisturizer at night to help with redness, and add a few drops to my pillow to ensure a restful night’s sleep. Did you know that one drop of DoTERRA peppermint oil is equal to the potency of 27 peppermint tea bags? Peppermint is known for helping soothe the occasional upset stomach, as well as clear up respiratory issues. Lemon is a powerful cleansing agent that can be used to clean the home, detoxify your body, and give you a healthy boost throughout your day. Lemon has also been proved to help improve mood and energy levels. Melaleuca is best known for its purifying properties. This oil is great to help support healthy skin and nails, and it is also a great cleaning agent – for both surfaces and the air. It is also a great anti-fungal and antibacterial agent, great for use on skin issues. This herb is a sick season must-have! Oregano is a very powerful oil that has been used for centuries to help boost the immune system from nature’s seasonal threats. Oregano can be taken internally with a veggie capsule or applied topically to the skin with the use of fractionated coconut oil. Frankincense has been dubbed the King of Oils and is a staple in my self-care routine. Due to the beautifying and soothing properties, this oils is great for skincare. It has also been known to support healthy cellular function throughout the bodily systems. doTERRA Breathe® is a blend of essential oils including Laurel Leaf, Peppermint, Eucalyptus, Melaleuca, Lemon, Cardamom, Ravintsara, and Ravensara. Breathe is a great oil for bedtime, as it can help to soothe respiratory issues and gives feelings of clear airways and easy breathing. doTERRA On Guard is best known for its work in helping the immune system fight off seasonal threats. It is a very powerful oil and can also cleanse the airways of harmful pathogens that might impact our immune system. This unique blend contains Ginger, Fennel, and Coriander to help ease occasional stomach discomfort, including motion sickness and indigestion, while Peppermint, Tarragon, Anise, and Caraway help with digestion. DigestZen® can be taken internally or rubbed on the stomach to aid with the process of digestion. I like to always have it on hand to calm a sour stomach! Wintergreen, Camphor, Peppermint, Ylang Ylang, Helichrysum, Blue Tansy, Blue Chamomile, and Osmanthus work together to soothe and cool even the tightest of muscles. With a few drops of fractionated coconut oil, Deep Blue® can create a soothing, cooling, and relaxing massage. When it comes to regulation of essential oils, the FDA does not have regulations around organic and natural, so it is important to purchase your essential oils from a source that you know and trust! DoTERRA’s third-party lab test results are available to the general public through sourcetoyou.com, so you know the oils you purchase through doTERRA are 100% pure and unadulterated. Oils purchased without strict testing and regulation may not live up to the standards of 100% certified pure oils, and could be filled with fillers and alcohols that are irritating to the skin. These oils may even produce the opposite effect of the intended use. Curious to know more about essential oils? Read my story. 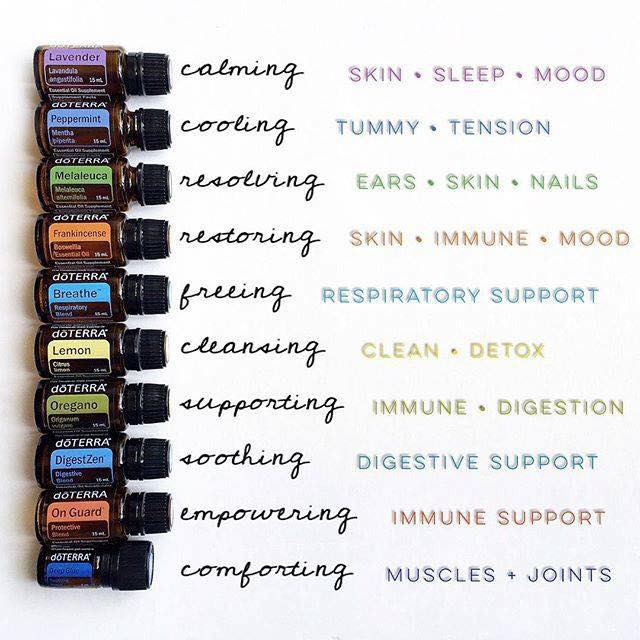 When selecting your essential oil starter kit, the Home Essentials kit has all of the oils I mentioned above, plus a diffuser! It’s really the best value and my personal favorite kit.